Today, on 27th September 2012 is the official date of birth of Google and Google is celebrating his 14th birthday by making beautiful doodle. Google made beautiful doodle on his birthday which is as follows. Actually, official domain name (www.Google.com) register date was 15th September 1997 and official birth date of Google is 27th September. Lets wishes Google a Great Birthday! So, Your website is affected by this Panda refresh?, You can share your valuable comments about this Panda refresh at here. 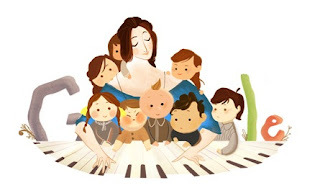 Today, on 13th September 2012, Google made beautiful Doodle on birthday of Clara Schumann. Clara Schumann was a musician. She was from Germany. According to Wikipedia, Clara Schumann born on 13 September 1819, was a German musician and composer, considered one of the most distinguished pianists of the Romantic era. Blogging Alerts also wishes a great birthday to Clara Schumann. Google Acquired VirusTotal? What is VirusTotal? Will Google Launch Google Antivirus? According to official post on VirusTotal Blog On 7th September, 2012 Google acquired VirusTotal. I personally think, there may be many persons which might be not knowing about VirusTotal. So, If you are one of them and looking for the information about VirusTotal then you can get all the details from here. Can, I Scan any Website or URL? Will Google Increase the File Size Limit in Future? Google may increase the file size but its depends upon Google. According to a thread posted on Google Groups, someone reply for the same question as follows. We are working continuously to improve our services. This is certainly something we will be considering in the near future. So, Google will Launch Google Antivirus, Soon? Only, Google can answer this. But, I personally think to make web better Google acquired VirusTotal. Did You Notice Wiki Loves Monuments: Photograph a Monument, Help Wikipedia and Win! on Wikipedia.com? Wiki Loves Monuments: Photograph a Monument, Help Wikipedia and Win! on Wikipedia.com? Wikipedia.com is one of the best open source website in the world where users can contribute important and useful information. Many times Wikipedia.com written various posts regarding helping Wikipedia and this time Wikipedia introduced "Wiki Loves Monuments: Photograph a Monument, Help Wikipedia and Win!" What is Wiki Loves Monuments India? Wiki Loves Monuments is an international photo contest around cultural heritage monuments in September. Starting from the Netherlands in 2010 and organized on a European level in 2011, we go global in 2012! Step 4. Upload your photos to the contest. Please only upload photos of which you are the photographer. Do not upload images from other websites. Copyright violations like these will be deleted immediately.